If you don’t read any further, this is what we recommend: 1 to 2 inches deep of 6-12 month old hardwood mulch spread 1 foot from the base of the tree 1/2 way out to the drip-line. For a fraction of the cost of maintenance, organic mulch helps our trees stay safe and healthy. Mulch quietly intercepts rain, reduces evaporation, moderates soil temperature, suppresses weeds, improves soil structure, lessens compaction, attracts soil animals and increases root growth; all while adding a pleasing texture to the landscape. While we can’t improve upon the forest, we can learn from it. Forest trees benefit from falling debris (litter). But it is not practical to allow fallen branches and trees to remain in the urban landscape. Mulch bridges this gap! Organic mulch helps our typically depleted urban soils return to like conditions found in fertile forest floors. But not all mulch is the same. Parts is Parts! Separated plant parts (such as bark, needles and leaves), and even inorganic mulch, may have its place in the landscape; such as weed control and aesthetics, when soil fertility is not an issue. While compost is usually worked directly into infertile soil, mulch is used as a topping or dressing. Since most of our urban trees and shrubs are stressed due to poor soil conditions, how best can they benefit from organic mulch? Aged Mulch. Our woody plants can flourish or suffer from the type of mulch we use and how we apply it. Based upon our own experience and research, we recommend 1 to 2 inches of aged (6 – 12 months old) hardwood (deciduous) all-tree, single-ground or double-ground mulch (stirred once a month). Why aged mulch? Since aged mulch has already started to break down, it will more immediately begin to benefit your soil, soil animals and trees. Fresh mulch takes longer to break down; and initially, may pull nitrogen from the soil, heat up the soil, and spread disease (if it comes in contact with roots). Aged mulch can usually be found at smaller venders and nurseries. The mulch at the back of the pile is usually older. City and county landfills often give it away. Most tree removal services have dump sites. Some may even dump on your property for free. In fact, chipper mulch (especially branches), whether from a tree care service, utility right away service or your own backyard portable chipper, has been found to be the best mulch for your trees (trees eat trees!). A tree care service should not be allowed to leave your yard with organic matter (except larger logs, if you don’t burn firewood). Why not have them dump their chips on your property? Or better yet, have them direct their chipper chute to a desirable area (possibly saving your money). In this way, you can let mulch age at your own discretion. But make sure your dump site is well marked, and not over the roots of your trees (at least 8 to 15 feet away from a small to large trees). While 1-year-old mulch is ideal, any amount of aging is better than fresh mulch if your trees are already stressed (which is the case with most urban trees). If this is too much bother, we may be able to recommend a company that can locate the best mulch in your area, and spread it if needed. Application. You should never mulch over the root ball of your trees. If you’re not sure where the edge of the root ball lies, a foot away from the root flares will work. In fact, all your trees should never have mulch closer than 1 foot from the trunk. And definitely never against the trunk, or over the root flares. Mulch should never be more than 1 inch deep for new installations, and never more than 2 inches for established trees and forest remnants. Mulch should be stirred once a month (especially during the growing season). How far out should you mulch? 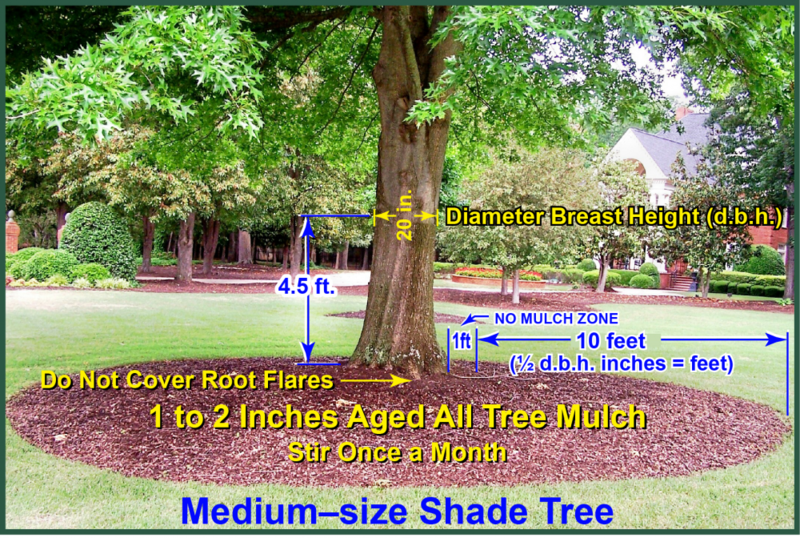 While the model above provides a formula for the minimum mulch bed size needed according to tree size (d.b.h. ), most trees would benefit with mulch out to their drip-line (furthest extent of the branches). Generally, small trees require a mulch bed about 4 to 6 feet out from the edge of the root ball; about 8 to 10 feet for medium trees; and 10 to 15 feet for large trees. To establish or expand an existing mulch bed, it will take some work and expense. But the benefits far exceed the trouble and cost. Trees with insufficient mulch beds require more maintenance, can be less safe, may be more attractive to pests, and be less drought resistant. And then there are those roots we keep running over with our mower. Asphalt, bagged, banana peels, bark, black, black walnut, bristlecone pine, burlap, cardboard, cardboard, cedar, cement, ceramic, cocoa hulls, concrete, conifer cones, conifer needles, creeping vines, grain, gravel, ground cover (any plant), cypress, dyed (any color), fine-textured mulch, fresh mulch, fruit, fumigated, glass, grass, gravel, ground-up tires, hay, hemp, hose, husks, juniper, leaves, lighter wood, magazines, metal, more than 20% conifer, mortar, newspaper, nut shells, pallets (ground-up or whole), nylon, paper, pine cones, pine straw, plastic, pods, redwood, rock, root barriers, rubber, sand, salt, sawdust, seeds, sequoia, shellfish shells, shredded mulch, straw, tar, tarps, treated, triple-ground, sprayed, vegetables, vines, weeds, wire, and any type of landscape fabric. While others mulches may work for others, this is what we recommend. We have personally dug up tens of thousands of stressed trees. Many of the mulches listed here have a story behind them (if not, research). 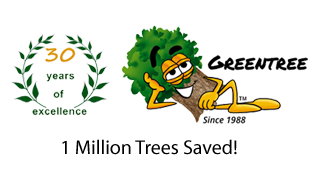 We are solely focused upon rehabilitating your stressed trees, and have a high success rate. Healthy Soil. How can you improve upon what is found in fertile forests? The topsoil is rich and deep; the roots numerous and deep; the trees healthy and long-lived. Now compare that with what you find under your present mulch beds. Does your mulch gradate until it becomes topsoil? Are there soil animals (such as earthworms) interacting with your mulch? Is your mulch physically changing your soil profile? Are your trees healthy? How much are you paying for your mulch? Homeowners who use premium, all-bark mulch spread 4 inches deep are spending “6 to 10 times more” than needed, while their trees & shrubs are likely suffering! A well-kept secret is that (in most cases), the cheaper the mulch, the better it is for your trees! You’re unlikely to hear that in a mulch yard. We don’t sell mulch. But we know what works, and what doesn’t. Or make your own concoction (compliments of the Dirt Doctor). Shake well before each spraying. Keep off desirable plants. Will not harm tree bark. Works best on hot, sunny days. Note: Some of these ingredients may be hard to find locally. You may have to order them online. If this is too much bother, please purchase or order the name brand products listed above (we will not be able to locate them for you). Healthy Trees! It is no accident that the pin oak above is the largest & healthiest oak in this subdivision. While the other oaks are decimated with bacterial leaf scorch, its leaves are large & healthy (compare with those in the background) primarily because it is properly watered & mulched (this section goes along with our watering section). The next time you walk your dog through the neighborhood, take a peek under the healthiest trees. You’ll likely find a sizable mulch-bed. But be careful of the ‘landmines’ left by other dogs. And don’t forget to watch our slideshow below (photos copyright Randy Cyr).